The TexVetPets.org website (“Site”) is a service provided by the Texas Veterinary Medical Association (TVMA) and the Texas Veterinary Medical Foundation (TVMF). All references to the TexVetPets.org referred to as (“Site”) in the foregoing Terms and Conditions of Use include TVMA and TVMF. TexVetPets.org reserves the right to amend the terms, conditions, and notices under which the TexVetPets.org Website is offered, without notice, including but not limited to the charges associated with the use of the TexVetPets.org Site. When we amend this policy the date of revision will be updated at the bottom of this page. We encourage Users to frequently check this page for any changes to stay informed regarding the Terms and Conditions of Use for this Site. You acknowledge and agree that it is your responsibility to review these Terms and Conditions of Use and become aware of modifications. Your continued use of the Site following the posting of changes to this policy will be deemed your acceptance of those changes. Certain provisions of this legal notice may be superseded by expressly designated legal notices or terms located on particular pages at the Website. The TexVetPets.org site may contain links to other Websites (“Linked Sites”). The Linked Sites are not under the control of TexVetPets and TexVetPets is not responsible for the contents of any Linked Site, including without limitation any link contained in a Linked Site, or any changes or updates to a Linked Site. TexVetPets has not reviewed, does not endorse and is not responsible for webcasting or any other form of transmission received from any Linked Site. TexVetPets is providing these links to you only as a convenience, and the inclusion of any link does not imply endorsement by TexVetPets of the site or any association with its operators. (h) you do not use materials on the site to promote the unlawful practice of veterinary medicine. The Site expressly reserves the right to revoke the right granted above for breach of these terms and to take any action it deems appropriate. You shall fully indemnify the Company for any loss or damage suffered by the Site or any of its affiliates for breach of the above clause. The contents of the TexVetPets.org site, such as text, graphics, images, information and advice obtained from TexVetPets.org’s licensors, and other material contained on the TexVetPets.org Site (“Content”) are for informational and educational purposes only. Information and references on this site to any specific veterinarian, test, product, process, service, medical procedure or treatment does not constitute or imply endorsement or recommendation of such by TexVetPets, TVMA or TVMF. While TexVetPets makes every effort to present accurate, medically reliable scientific information on this Site, TexVetPets, TVMA and TVMF do not approve or certify such information nor guarantee the accuracy, completeness, efficacy, timeliness or correct sequencing of such information. Use of such information is voluntary and at your own risk and is not a substitute for the professional medical advice, diagnosis or treatment by a Doctor of Veterinary Medicine who has actually examined an individual’s animal or possesses firsthand knowledge of an animal’s condition. 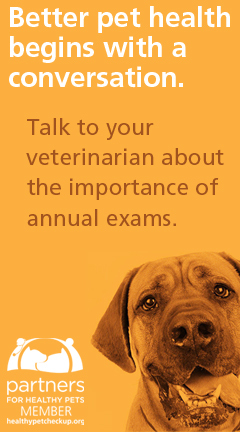 Always seek the advice of your veterinarian or other qualified health provider with any questions you may have regarding a medical condition. Never disregard professional medical advice or delay in seeking it because of something you have read on the TexVetPets Site! If you think your pet may have a medical emergency, call your veterinarian immediately. TexVetPets, TVMA and TVMF (including its employees, agents, officers and directors) are not responsible for, and expressly disclaim all liability for, damages of any kind arising out of use, reference to or reliance on the information available through this Site. No approvals, recommendations, endorsements, guarantees or warranties, including, but not limited to, any express or implied warranties of merchantability or fitness for any particular use or purpose of products or services named on this Site are made by the TexVetPets, TVMA and TVMF. You are granted a personal, revocable, limited, non-exclusive, non-transferable license to access and use the Site conditioned on your continued acceptance of, and compliance with, these Terms. As a condition of your use of the TexVetPets.org Website, you warrant to TexVetPets that you will not use the TexVetPets.org Website for any purpose that is unlawful or prohibited by these terms, conditions, and notices. You may not use the TexVetPets.org Website in any manner which could damage, disable, overburden, or impair the TexVetPets.org Website or interfere with any other party’s use and enjoyment of the TexVetPets.org Website. You may not obtain or attempt to obtain any materials or information through any means not intentionally made available or provided for through the TexVetPets.org Websites. You acknowledge and agree that TexVetPets.org and the information, content, and software presented to you through TexVetPets.org contains proprietary and confidential information that is protected under U.S. and international intellectual property laws, including copyright, trademarks, service marks, patents, or other proprietary rights and laws. Except as expressly authorized by TexVetPets or our suppliers, you agree not to sell, rewrite, modify, redistribute, create derivative works, or rent any information presented to you through TexVetPets.org, in whole or in part. Site reserves the right to bar, restrict, suspend, or terminate any user’s access and/or terminate this license at any time for any reason. Unless otherwise expressly stated in these Terms, or unless you receive Sites prior written consent, you may not modify, translate, create derivative works of, copy, distribute, market, display, remove or alter any proprietary notices or labels from, lease, sell, sublicense, transfer, decompile, reverse engineer, or incorporate into any information retrieval system (electronic or hard copy), the Site, any Content, or any portion thereof. We are committed to protecting the privacy of children. You should be aware that this Site is not intended or designed to attract children under the age of 13. We do not knowingly collect personally identifiable information from any person we actually know is a child under the age of 13. Each registration is for a single user only. The Site does not permit you to share your user name and password with any other person nor with multiple users on a network. TexVetPets offers several features that allow you to record and store information. You are responsible for taking all reasonable steps to ensure that no unauthorized person shall have access to your passwords or accounts you use to access this site. You further agree that you are responsible for all activities that occur under your password or account. It is your sole responsibility to (1) control the dissemination and use of activation codes and passwords; (2) authorize, monitor, and control access to and use of your account and password; (3) promptly inform us of any unauthorized use of your password or your account. The TexVetPets.org Website may contain bulletin board services, , news groups, forums, chat areas, communities, personal web pages, calendars, and/or other message or communication facilities designed to enable you to communicate with the public at large or with a group (collectively, “Communication Services”), you agree to use the Communication Services only to post, send and receive messages and material that are proper and related to the particular Communication Service. Defame, abuse, harass, stalk, threaten or otherwise violate the legal rights (such as rights of privacy, intellectual property and publicity) of others. Publish, post, upload, distribute or disseminate any inappropriate, profane, defamatory, infringing, obscene, slanderous, sexually explicit, hateful, abusive, indecent or unlawful topic, name, material or information as determined by TexVetPets in its sole discretion. Advertise, endorse or offer to sell or buy any goods or services for any business purpose, unless such Communication Service specifically allows such messages. Engage in or promote any anticompetitive conduct or inappropriate conversations or conduct that could have anticompetitive effects or could constitute a restraint on trade. TexVetPets.org, TVMA and TVMF are under no obligation to monitor, move or remove the Communication Services or any comments posted or uploaded However, Site reserves the right to review materials posted to a Communication Service and to remove any materials in its sole discretion. TexVetPets reserves the right to terminate your access to any or all of the Communication Services at any time without notice for any reason whatsoever. TexVetPets reserves the right at all times to disclose any information as necessary to satisfy any applicable law, regulation, legal process or governmental request, or to edit, refuse to post or to remove any information or materials, in whole or in part, in TexVetPets’s sole discretion. Materials uploaded to a Communication Service may be subject to posted limitations on usage, reproduction and/or dissemination. You are responsible for adhering to such limitations if you download the materials. All Content provided by you or any other party other than TexVetPets, TVMA or TVMF must identify the party who provided that Content. Anonymous posting or uploading of any Content is strictly prohibited. You warrant and represent that you either own or otherwise control all of the rights to that material, including without limitation, all the rights necessary for you to provide, post, upload, input, or submit the material, or that your use of the material is a fair use as defined by applicable law; We ask that you not post any messages with misleading, false, or inappropriate language or statements. We reserve the right to remove any content that we deem offensive or fraudulent at any time without your consent. You acknowledge that no compensation will be paid with respect to the use of your Content or Submission, as provided herein. TSite is under no obligation to post or use any Submission you may provide and may remove any Submission at any time in TexVetPets.org’s sole discretion. We reserve the right at any time and from time to time to modify or discontinue, temporarily or permanently, our site (or any part thereof) with or without notice. You agree that TexVetPets.org shall not be liable to you or any third party for any such modification, suspension of our site. THE INFORMATION, SOFTWARE, PRODUCTS, AND SERVICES INCLUDED IN OR AVAILABLE THROUGH THE TEXVETPETS.ORG WEBSITE MAY INCLUDE INACCURACIES OR TYPOGRAPHICAL ERRORS. CHANGES ARE PERIODICALLY ADDED TO THE INFORMATION HEREIN. TEXVETPETS.ORG AND/OR ITS SUPPLIERS MAY MAKE IMPROVEMENTS AND/OR CHANGES IN THE TEXVETPETS.ORG WEBSITE AT ANY TIME. ADVICE OR INFORMATION RECEIVED VIA THE TEXVETPETS.ORG WEBSITE SHOULD NOT BE SOLELY RELIED UPON FOR PERSONAL, MEDICAL, LEGAL OR FINANCIAL DECISIONS AND YOU SHOULD CONSULT AN APPROPRIATE PROFESSIONAL FOR SPECIFIC ADVICE TAILORED TO YOUR SITUATION. INFORMATION REGARDING SPECIFIC THERAPIES OR STANDARDS OF CARE SHOULD BE VERIFIED THROUGH OTHER RELIABLE AND TRUSTWORTHY SOURCES. TEXVETPETS.ORG AND/OR ITS SUPPLIERS MAKE NO REPRESENTATIONS ABOUT THE SUITABILITY, RELIABILITY, AVAILABILITY, TIMELINESS, AND ACCURACY OF THE INFORMATION, SOFTWARE, PRODUCTS, SERVICES AND RELATED GRAPHICS CONTAINED ON THE TEXVETPETS.ORG WEBSITE FOR ANY PURPOSE. TO THE MAXIMUM EXTENT PERMITTED BY APPLICABLE LAW, ALL SUCH INFORMATION, SOFTWARE, PRODUCTS, SERVICES AND RELATED GRAPHICS ARE PROVIDED “AS IS” WITHOUT WARRANTY OR CONDITION OF ANY KIND. TO THE FULL EXTENT PERMISSIBLE BY APPLICABLE LAW TexVetPets.org AND/OR ITS AFFILIATES AND SUPPLIERS HEREBY DISCLAIM ALL WARRANTIES EXPRESS OR IMPLIED AND CONDITIONS WITH REGARD TO THIS INFORMATION, SOFTWARE, PRODUCTS, SERVICES AND RELATED GRAPHICS, INCLUDING ALL IMPLIED WARRANTIES OR CONDITIONS OF MERCHANTABILITY, FITNESS FOR A PARTICULAR PURPOSE, TITLE AND NON-INFRINGEMENT. TexVetPets reserves the right, in its sole discretion, to terminate your access to the TexVetPets.org Website and the related services or any portion thereof at any time, without notice. By using this site you agree that you agree that no association, joint venture, partnership, employment, or agency relationship of any kind exists between you and TexVetPets.org, TVMA or TVMF as a result of this agreement or use of the Site. TexVetPets’ performance of this agreement is subject to existing laws and legal process, and nothing contained in this agreement is in derogation of TexVetPets’ right to comply with governmental, court, and law enforcement requests or requirements relating to your use of the TexVetPets.org Website or information provided to or gathered by TexVetPets.org with respect to such use. All provisions of this Agreement are severable. If any provision or portion hereof is determined to be unenforceable in arbitration or by a court of competent jurisdiction, then the remaining portion of the Agreement shall remain in full effect. 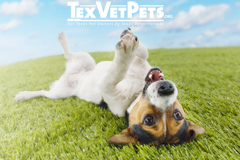 All contents of the TexVetPets.org Website are: Copyright 2014 Texas Veterinary Medical Association and/or Texas Veterinary Medical Foundation or other affiliates. All rights are expressly reserved. All content and materials published on the Site including but not limited to text, images, video, graphics, logos, button icons, audio clips, digital downloads and multimedia files (“Content”) are protected by all applicable intellectual property laws, including without limitation copyright and trademark laws, and owned by TexVetPets.org, TVMA, TVMF or the party credited as the provider of the Content. All rights in the Content are expressly reserved by the applicable copyright and trademark owner. Nothing contained on this website should be construed as granting any license or right to use any trademark without the prior written permission of the website owner. The written content, information and materials displayed on this website which are owned by the respective authors of each may not be reproduced in whole, or in part, without the express written permission of the author. Site users may not sublicense, transfer or otherwise make any Content available to any third party for commercial purposes or financial gain or use the Content in any other media or in any other location other than as permitted under these Terms. 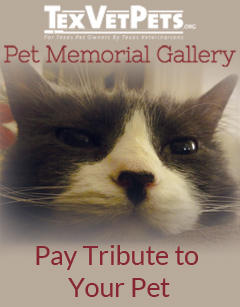 TexVetPets.org and affiliates respect the intellectual property of others. Pursuant to Title 17, United States Code, Section 512(c)(2), notifications of claimed copyright infringement under United States copyright law should be sent to Service Provider’s Designated Agent in the properly specified format below. A description of the copyrighted work that you claim has been infringed upon and where it may be found. Your contact information including a name, phone number, address and email. Thank you for your cooperation. We hope you find the TexVetPets.org Site helpful and convenient to use! Questions or comments regarding this website, including any reports of non-functioning links, should be submitted using our Contact Us Form or via U.S. mail to: Texas Veterinary Medical Association, 8104 Exchange Drive, Austin, Texas 78754.